All hopes of a decisive breakthrough on the Somme had been dashed by the carnage wrought by German machine gun and artillery fire on 1st July 1916. It took a further 140 days of bitter fighting to drive the Germans off the ridge between the rivers Ancre and Somme. It was only on 13th November that a renewed attack was attempted on the left of the battle front against the fortified villages of St. Pierre Divion, Beaucourt, Beaumont Hamel and Serre. The situation in front of Serre was even less auspicious for the British than it had been before the attack of 1st July. The ground below the village was now a sea of deep, cloying mud overlayed with more sophisticated and more densely concentrated barbed wire entanglements. At 5am on 13th November, shrouded in fog, the leading battalions of 76th Brigade (3rd Division) moved into No Man's Land, crossing the same ground over which the men of 94th Brigade had fallen over 4½ months earlier. History was to repeat itself. On the left of the Brigade front, few of the 2nd Suffolks were able to penetrate the German wire. Behind them, the 8th King's Own were caught in No Man's Land by a devastating artillery barrage. On the right, men of the 10th Royal Welch Fusiliers and 1st Gordon Highlanders fought their way as far as the German 4th Line but were eventually overwhelmed. As the Battle of the Somme drew to a close with the capture of St. Pierre Divion, Beaucourt and Beaumont Hamel, Serre remained in German hands. Towards the end of October 1916, an RFC patrol reported sighting new trench lines several miles east of the battle front. 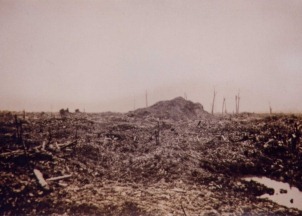 This was the first glimpse the Allies had of the "Siegried Stellung" or Hindenburg Line - a defensive position of awesome strength and depth to which the exhausted German Army of the Somme could withdraw. "The above report seems almost incredible but I am of an opinion that it is reliable. If so, it points to the evacuation of SERRE by the enemy." By evening there was every indication that the enemy had retired along the whole length of the V Corps front, and orders were issued for an advance through Serre on the following morning. 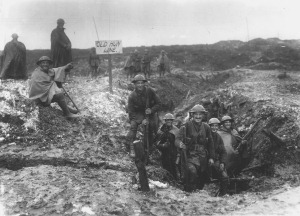 Above: British troops in a captured German trench at Serre. Photograph courtesy of the Imperial War Museum, London (Q1787). Click to enlarge Above: Site of Serre Village, May 1917. Photograph courtesy of John Facer. "In trenches. Serre attacked and occupied. Bn HQ moved to MOUSE POST, Bn relieved by 1st RWF in trenches beyond SERRE - relief complete 8.14PM. Marched back to billets in MAILLY-MAILLET. 1 O.R. killed, 7 O.R. wounded." A detailed account of the occupation of Serre is given in Col. Norman's Report on Operations. 239 Days after the opening of the Battle of the Somme, the German withdrawal to the Hindenburg Line had finally yielded Serre to the Allies. Compiled from "Military Operations, France and Belgium, 1916 Volume II", 1938; 7th Division General Staff Diary WO95/1632; 21st Manchester Regt. Diary WO95/1668.